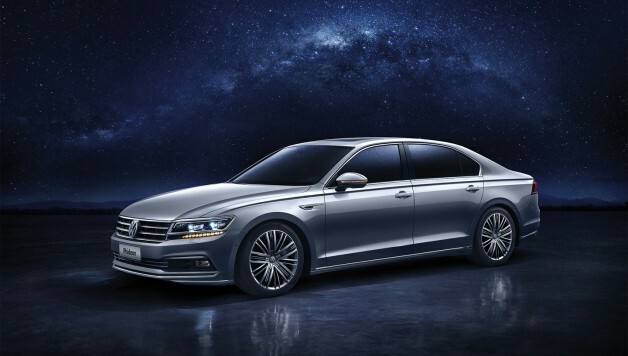 VW is finally ready to replace the aging Phaeton in China with an all-new fullsize sedan which will be positioned above the locally sold Magotan, the VW Phideon. 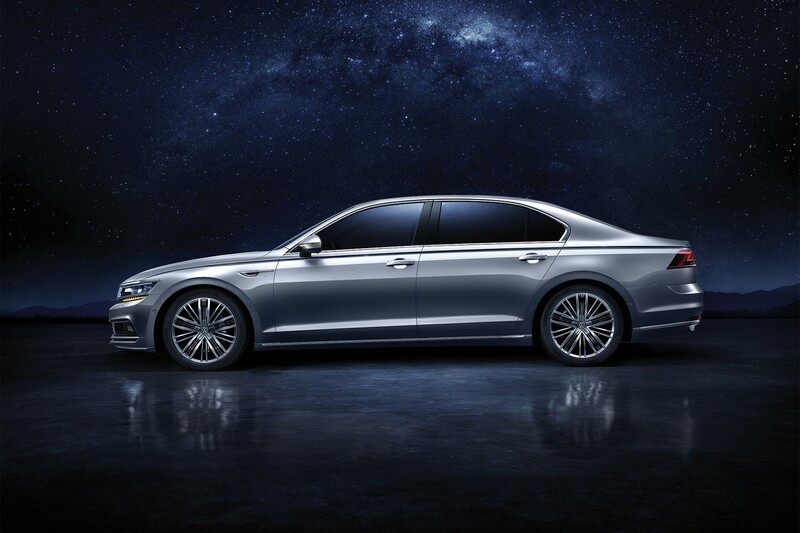 With the debut of the VW PHIDEON, which was developed and designed in Germany, Volkswagen is adding a crucial pillar to its model range. When designing this car, Volkswagen made use of the technical expertise of its Chinese partner, SAIC Volkswagen, particularly its extensive experience of the wishes and requirements of customers. SAIC Volkswagen will also manufacture the new model. Volkswagen’s design team is proud that it was possible to derive the PHIDEON almost directly from the breathtaking C Coupé GTE concept car, presented at Auto Shanghai in 2015, with only minor changes. From a technical perspective, the PHIDEON is the first Volkswagen to be based on the Modular Longitudinal Matrix (MLB). Its name – PHIDEON – is a construct standing for elegance and reliability, and phonetically and symbolically evokes Fides, the Roman goddess of fidelity. The top-of-the-range model – the PHIDEON 3.0 TSI 4MOTION, which comes with four-wheel drive as standard – is powered by a 3.0-liter V6 turbocharged and direct-injection gaosline engine that produces 220 kW/300 PS. This efficient TSI engine develops maximum torque of 440 Nm (347 lb-ft). The new five-seater Volkswagen will also be available as a 2.0 TSI four-cylinder engine with front-wheel drive. A model with a plug-in hybrid trains also planned for the future. The PHIDEON is 5.05 meters long, 1.87 meters wide and 1.48 meters high (197 x 73.6 x 58.3 inches). The extremely short front and rear overhangs, combined with a wheelbase of more than three meters (118 inches), give the car particularly sporty proportions. The eye-catching long hood combined with a short front overhang results in an especially powerful and elegant premium class design. In combination with the elongated cabin, this results in a powerful and simultaneously elegant, flowing layout for the PHIDEON. Apart from the sharp contours of the hood, the front is characterized by a wide and comparatively high grille that consists of four chrome bars, with two of the chrome-plated crossbars framing the dual LED headlights. 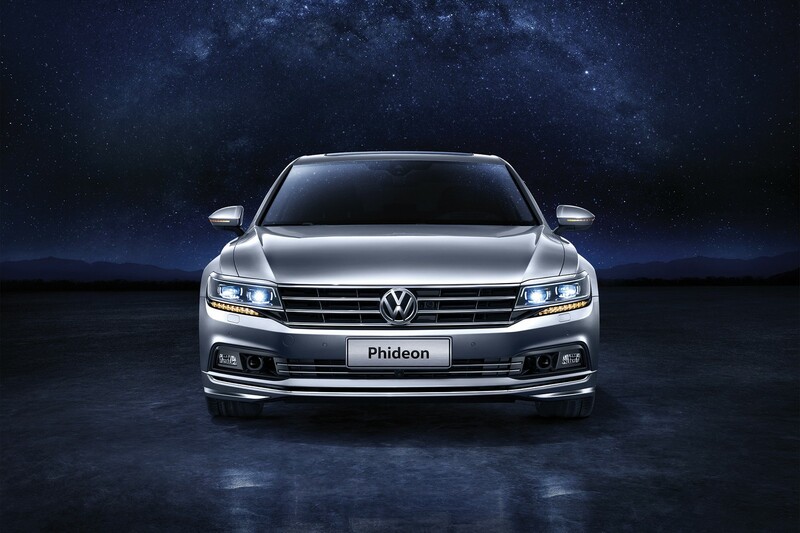 This bold unit of grille, headlights and LED daytime running lights forms the “face” of the PHIDEON. This design DNA will also be found in the brand’s future high-end sedans. The exclusive overall impression of the PHIDEON is rounded off by a wrap-around chrome border, which elegantly finishes the lower section that slopes down towards the rear. The side profile has a distinctive character line formed by two lines – a distinctive, razor-sharp drawn-out line over two surfaces, extending from the front fenders to the back in the trunklid. This double character line develops into a powerful shoulder. The large wheelarches are also defining design cues, reaching far up into the vehicle body and underlining the PHIDEON’s dynamic design. Like the front end, the design at the rear is also dominated by a horizontal division of the surfaces, accentuating the car’s width. The character lines, which run around the car right up to the trunklid, frame the upper rim of the LED taillights. A wrap-around chrome strip in the lower body area ends in stainless steel exhaust tips. The VW PHIDEON was designed as a sporty five-seater that appeals both to keen drivers and as a chauffeur-driven limousine because it is so spacious. The interior is thus both sporty and elegant. The dashboard and the interior architecture are designed to focus on the technical design and driving dynamics in the cockpit. The luxurious seats can be electrically adjusted in several directions, including individual settings for the ergonomically curved sides, and have integrated seat ventilation and heating as well as a massage function. The design team created a relaxed lounge atmosphere inside the car, with a wrap-around ambient light strip that can switch between three different colours. 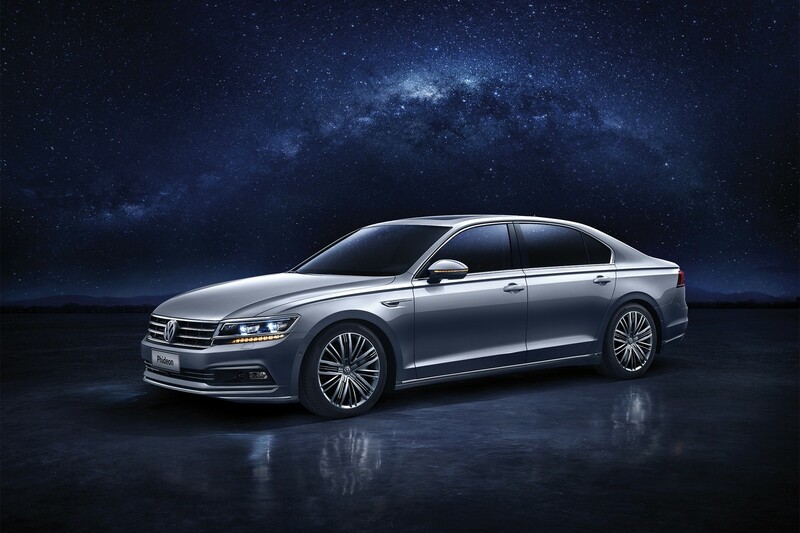 The new VW PHIDEON offers a host of high-end features. It continues the Volkswagen tradition on its luxury cars – introduced with Phaeton – of using an air suspension system, similar to the systems used by fellow Volkswagen Group brand Bentley. The latest generation of this technology has five individually selectable driving modes. Another new feature is the electric soft-closing system for the doors, called “Soft Close”. This new sedan also has the full technology spectrum of the Modular Longitudinal Matrix (MLB) at its disposal. When it comes to driving information, this includes features such as a head-up display (which projects information onto the windscreen) and a camera-based night vision system that warns the driver if there are people or animals on or near the road, even in pitch-black darkness or in fog. Area View – a system with four wide-angle cameras – improves all-round visibility. Other assistance systems include: ACC (adaptive cruise control); Front Assist; Park Assist (assisted parking with automatic steering and braking); Lane Assist (camera-based lane-departure warning system); Side Assist (lane-changing assistant); the proactive occupant protection system (which tensions the safety belts and closes the windows or the sunroof); and Light Assist (which automatically dips the high beam). These systems protect the occupants of the PHIDEON, while also giving consideration to other road users. Last but not least, the new Volkswagen has optimum connectivity. This is ensured through the Modular Infotainment Platform (MIB) that can be used to integrate compatible smartphones via the three major smartphone platforms — CarPlay® (Apple), Android Auto™ (Google), and MirrorLink®.